Every patient deserves to have a beautiful smile they can share with complete confidence, making great impressions in every personal and professional situation. Whether you just want to brighten your smile or you’re interested in a complete smile transformation, the EcoDental team offers a full range of Sugar Land cosmetic dentistry services to deliver the picture-perfect smile of your dreams. Best of all, we customize treatment plans to fit your schedule and budget. If you’re ready to get started, call to schedule a cosmetic dentistry consultation in our state-of-the-art Sugar Land dental office today. If you want to transform your smile, the first step is a consultation visit. We’ll examine your smile, answer questions, discuss treatment options, and partner with you to create a cosmetic dental plan that meets your needs. Below, you’ll find basic information about some of our most popular cosmetic dentistry services. 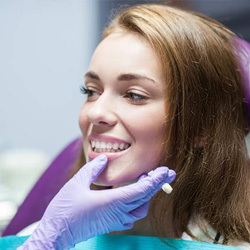 Creating a flawless smile doesn’t haven’t to mean a lengthy treatment process. With porcelain veneers, we can correct or conceal a number of chips, cracks, stains, and gaps in teeth, leaving you with a beautiful smile you’ll be proud to share. We simply craft ultrathin sheaths of porcelain that are affixed to the front facing surfaces of teeth to perfect your smile. The entire process is completed over the course of just two dental visits. Combining the best of cosmetic dentistry with fully functional dental restorations, metal-free crowns, bridges, inlays, onlays, and tooth-colored fillings repair dental damage and fully restore the look of your smile. 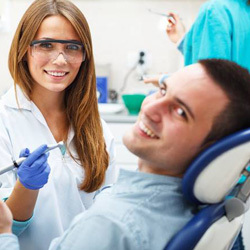 Direct bonding is a great option for those patients who need to touch up the overall appearance of their smiles, but they don’t have any severe damage or decay. In just one visit to our office, we can repair numerous small cracks and chips, close gaps between teeth, and conceal staining, using tooth-colored composite resin. This is the same material used for fillings. If you’ve tried store bought teeth whitening options with little to no change in the appearance of your smile, it’s time to work with our team to create a professional teeth whitening plan. If you want to see results fast, you should consider in-practice teeth whitening. These procedures typically take about an hour. 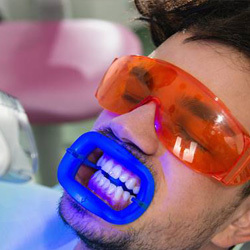 At the end of the treatment, your smile could be as much as ten shades brighter. Some patients experience dental sensitivity following in-office teeth whitening treatment, and we may recommend professional topical fluoride application to help reduce this sensitivity. Take-home whitening kits offer the same results possible with in-office teeth whitening from the comfort of home. Over the course of ten to fourteen short, daily applications, patients achieve smiles as much as ten shades brighter. Take-home whitening kits can even be used to touch up the results of in-office teeth whitening. If your smile looks gummy or teeth look stubby, you may want to consider gum recontouring. This is a treatment that reduces or reshapes the gum tissue to create a healthy, beautiful smile line. We may also need to perform these services in preparation for restorative procedures. This preparatory treatment is called crown lengthening. Smooth, wrinkle free skin is a great way to compliment the results of your cosmetic dentistry plan. Our team offers Botox Cosmetic injections to reduce the appearance of fine lines and wrinkles. These quick, painless injections can be performed over your lunch break, and they leave you looking younger for months.